This entry was posted in Abuse of power, Corruption, Councillor Greed, Democratic Deficit, Elections 2014, Greedy Councillors, Greedy Piggies, UKIP and tagged Caven Vines, Rawmarsh, Rawmarsh Ward, UKIP by Rik. Bookmark the permalink. Well done! Putting some of his allowance back into the community. Wow!!! I know who I will be voting? Looks good to me. I await a similar response from the UKIP candidate for Anston and Woodsettes ward council position in the May election, before I decide to vote for them. UKIP national policies won’t help Anston at this level. 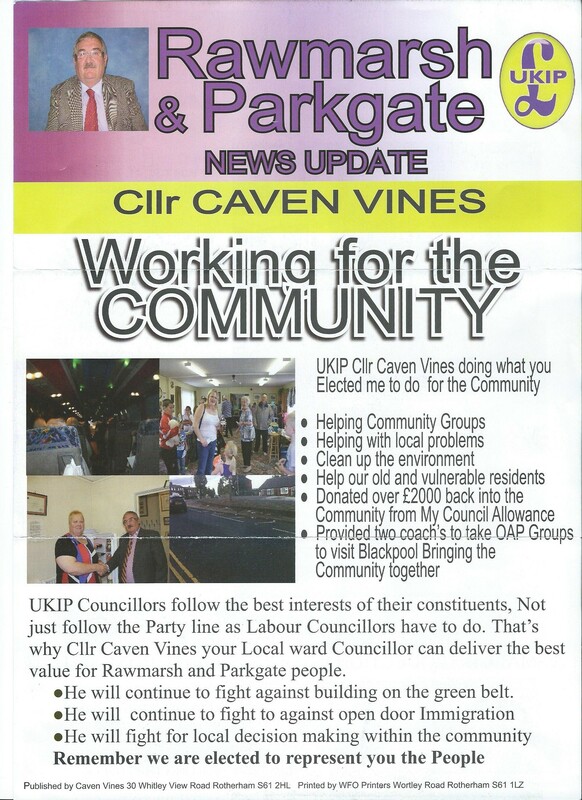 Agreed, so it’s sad that Caven’s leaflet mentions UKIP’s contentious Immigration policies. But it doesn’t stop me liking what Caven is doing. I think it’s great. In Anston and Rawmarsh (correct me if I am wrong), mass immigration may not be an issue, but in many area’s of Rotherham it is and there should be no shame in saying so. Alright what can mr vines do as he is only one councillor he cant do anything as one councillor compared to 50 labour councillors. He is showing the way, and that’s a lot! You have to start somewhere, otherwise you never get anywhere. Like to remind you, the mighty Oak starts off as an acorn! But unless you give us a try you will never know will you we cant be any worse than what you got already now can we ?? Caven. I think most people knew up front that you would be strong on community and walk your talk. But the silence is deafening from the Anston and Dinnington UKIP candidates. As an Anston person since 1966, I have seen our village grow from 3K to 10K, whereas in the same time our services and facilities have been decimated. Rotherham for some reason thinks we resolve around Dinnington, but we are now larger than Dinnington. I need to know the UKIP candidate will fight this issue. If the UKIP candidate did get in, that would mean all three ward councillors won’t live in Anston. Or Anston and Dinnington could work together more and get a better deal for both. Divide and conquer is a Labour tactic, please stop helping them with it Tim! You have put the mealy-mouthed-toe-the-party-line Labour councillors to shame. 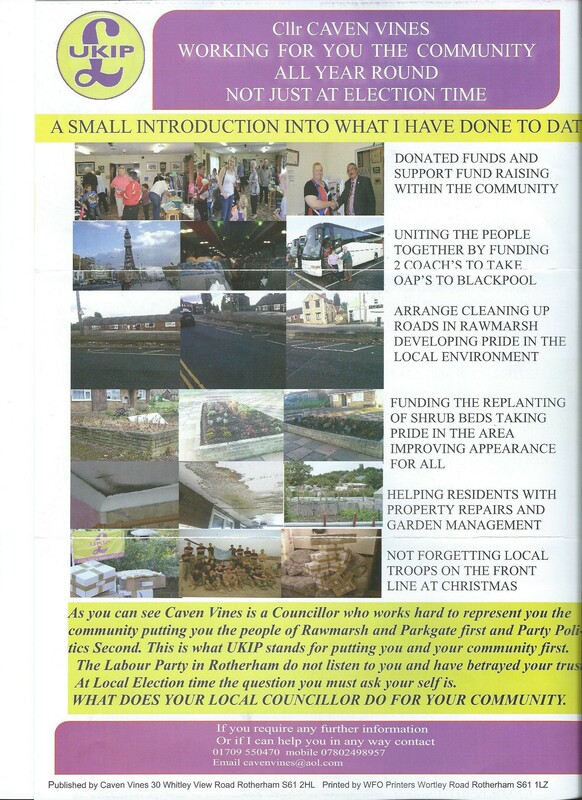 Pity Jo Burton and Judy Dalton will not follow your example of what being a Borough councillor really means. I hope your constituents really appreciate what you do for them. You are a credit to yourself and your party. ” what can Mr Vines do as he is only one Cllr”, Well for starters he has questioned why one Committee was holding items in “secret Session”, and got it changed. Just his presence as an “outsider” (not Labour) throws them in to all sorts of problems, because there are now lots of things that the Labour ruling group cannot hide. Its got to start somewhere and it takes a lot of guts to stand up to the Establishment. Things are changing in Rotherham, and if only two or three more Candidates (of any party) get in, just watch the fireworks fly in town hall towers. One last thought, Labour have their own offices in the town Hall, as do the Tory`s, so why don’t the Independent and the UKIP Cllrs have their own Offices??. Maybe Caven should ask the question at the next Meeting. Are you going to stand as a Ward councillor Stuart in the may election? Otherwise all three award councillors will live outside the village, not good for sustainability. does the money caven says he donated come from his own allowances or is it from the community leadership fund ? As I understand it all cllrs receive this fund which can only be used in the community. If it’s from his personal allowance hats off to him. Caven’s newsletter states quite clearly he donated from his allowances. So that would be £2,000 of his own money then! This would be In addition to the Community Chest money, £1,000 I believe, which has been mostly distributed. This must be unprecedented, as I cannot remember any of the greedy, grasping and frankly avaricious Labour Councillors, who are only in it for what they can get! Just like Sir Nutkin in fact! I don’t live in my ward but that does not retract me from giving 100% commitment to the people who put their trust in me to represent their best interests. Cavin. Not every body is you, we have spoken in the past about your trade union days and your strong ethics and values. Do your local youngsters have a youth club? Lets take the Kevin Barron versus the beast of Bolsover and John Mann, both Dennis and John fight tooth and nail for their communities, but I can’t say the same of Kevin Barron. I am not hearing anything from the Anston UKIP councillor, that he is going to help create a more sustainable Anston and fight for services and facilities we are denied and lose to Dinnington and other areas of RMBC. ‘His’ indirectly. Money for allowances to councillors comes from the public purse does it not? As Caven states; ‘Donated over £2000 back into the Community from my Council Allowance’. Unlike Labour councillors who give 7% of their allowances to the Labour party and pocket the rest. Their role model is Sir Kev of Maltby. ie:” It’s mine and I’m keeping it”. I think we have to take each UKIP councillor one at the time and ask what they will do for each community they represent. Just voting blindly for somebody because they are representing UKIP isn’t the answer. When we get up to the level of MP’s it is a whole different ball game, because standing against Kevin Barron as an Independent is nigh on possible. £500 isn’t a lot to stand, but being able to get your message across to all of Rothervalley is the issue, without a party machine. At this level I have no alternative but to vote for UKIP. But at a local level £50 for a few thousand flyers and dusk to dawn delivering them, any Independent can succeed against Labour. I hope you stand for the parish council Tim! Anonymous. Is that Dave Smith? I have asked the electoral part of RMBC to send me notice. If I don’t think the UKIP councillor will stand up for Anston enough I may just, I don’t believe a Parish council should be used to represent the will of a political party, it’s about the people who live there. We have had enough with Labour using us in the past. Give me a couple of weeks and I can deliver thousands of leaflets. I know the Conservative candidate promised Anston people change, then flipped to Labour, after a number of the community fell for his charms. I certainly think Dinnnington and Anston should come together to obtain collective things and other times we have to fight for communities separately. It would be great to see a planning department located in Anston and Dinnington, which is quite easy now with modern IT, 11 miles to travel into Rotherham is too far for people who are working. Surely “modern IT” as you call it, should allow residents of Anston and Dinnington to communicate with a centralised Planning department? Do you have a RMBC Service Centre or Library with PCs? ( If not that is what you should be campaigning for.) … or is it the connection speeds to ISPs that is the problem? RMBC’s head of IT is a very competent guy, check out his blog – http://therichardcopley.wordpress.com/ – whilst I’d disagree with him on some things, I do admire his energy and vision. RMBC’s Information & Online Services Manager – who runs the website – is just as good as it gets. We did have a service centre which RMBC closed and moved to the library, then they cut the library hours and staff! Never mind the planning department I would go for a return to Kiveton Rural District and allow what is now Rother Valley South to leave the Rotherham Borough and buy services ourselves either privately or from neighbouring authorities like Bassetlaw. Most people in Dinnington and Anston feel little affinity for Rotherham, it’s just a place our taxes go to be spent. People have more of a connection to Sheffield and Bassetlaw, not Rotherham. LoveDinnington, you have stated the case expertly and what I would see our ultimate goal. This was my reason for having a planning department in Anston and Dinnington. Compute access isn’t enough, people need to be able to speak to people. “We did have a service centre which RMBC closed and moved to the library, then they cut the library hours and staff!” Ouch! … and opened up our Aston/Swallownest one. I sympathise, I live right on the border with Sheffield and seldom venture further into Rotherham than Swallownest. Regular reader. You may understand our anger in Dinnington and Anston, when we as children in the 70’s raised half of the funds to provide a school and community pool in Dinnington, the Rural district gave us the other 50% and the Pool was put into a trust. RMBC then chose to close our pool and gift Maltby and Aston new pools, I don’t know whether they ever contributed to the pools they had in the community or whether those were gifted. I understand that we in Anston pay the highest rates in RMBC, with the lowest number of services and contributed to a football ground in Rotherham, that has nothing to do with us what so ever. Most people around her support either Sheffield football club or Worksop Town. So they deliberately closed Baths by deliberately running them down so to allegedly saying they were unsafe and the cost to upgrade was unsustainable. So they Closed them some were left to be vandalised so they had to demolish on safety grounds Rawmarsh Baths hall prime example. But they can’t afford to look after our own communities Our Care homes our roads basically they will prioritise on everything but what really matters to the Tax payers.